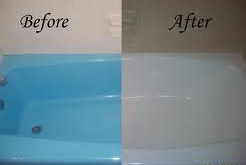 We are glad to be here for you, at the time you need a professional company for reglazing you tub or counters. We will be the best choice you make to get a professional service company, but inexpensive, fast service, reliable, licensed trusted company on your side. We offer to save you up to 70% option or reglazing instead of replacing. We do not leave grit and demolitions, disposal making a mess inside your house. Freshness look to you tub, shower or kitchen counter and vanity. Do not throw away thousands of dollars replacing!!!!!!!! We do service: commercial necessities, like rental units motels, hotel and restaurants. We serve residential customers; construction companies (not only reglaze but repair also). We serve investor real state and bank repos. Remodeling (most of bathrooms and kitchen).